Hot weather, cold weather, dry air; There are many things that can dry out your skin, making it itchy, red or flakey. Luckily there are also many things you can do to relieve your dry skin. With the summer months coming up, it's important to give your skin some extra love to keep it healthy and moist. That's why Spa Sophia is sharing these five tips for dry skin. Read and learn! Soap and cleansers with alcohol and harsh chemicals strip your skin of its natural oils and protective barrier, and will leave it dry. That's why using gentle, fragrance and soap free cleansers is a better idea if you have a dry skin. Spa Sophia has a great selection of all natural, gentle cleansers. Check them out at our web shop or at our spa. What helps a dry skin? Moisturizing, of course! Again, be careful with moisturizers that have fragrances or anti-bacterial components, as they can be harsh on your skin. 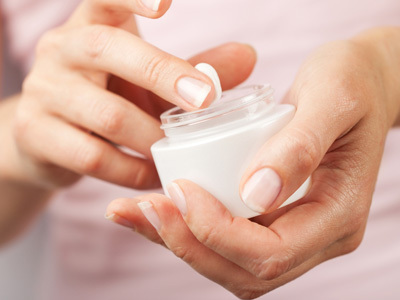 Another good thing to look for when buying moisturizers - especially for the aging skin - is ceramides. Ceramides are fatty molecules in the outer layer of the skin that help protect it, but their numbers decline over time. Moisturizers that contain synthetic ceramides can restore this. In general, we recommend the moisturizers from our featured brands Jurlique, Hylunia, Epicuren and Intraceuticals. See a selection of favorite moisturizers in our webshop. A long, hot shower or bath can be wonderfully therapeutic, but if you want to be good to your skin don't take one to often. The hot water strips your skin of its protective oil barrier much like soap does, and thus will dry out your skin. Cold, lukewarm and warm showers are fine, with a length of somewhere between 10 and 15 minutes. It's also not recommended that you shower every day, 3 to 4 times a week is sufficient. But if you work out a lot or really like showering every day, at least keep the water temperatures and shower duration in check. Los Angeles has a very dry climate, which can wreak havoc on skin prone to dryness. The same goes for people that spend a lot of time in air conditioned buildings or buildings in cold climates where the heat is on. A humidifier can therefore provide a lot of relief for dry skin. You can get portable ones or have a central installation installed in your home. The best and most enjoyable option to rejuvenate dry, damaged skin is of course a facial or essential oil massage. Book one at Spa Sophia online or call us at 310.564-6676.